Hours after the resignation of John Dowd, President Trump's lead attorney handling the special counsel investigation, Trump said he "would like to" testify in Robert Mueller's ongoing probe - a move panned by some, including Fox's Judge Napolitano, as a bad move. The President's 180 comes after the White House legal team had reportedly been considering ways that President Trump might be able to testify - including giving written answers - with Trump's attorneys reportedly having been split on the terms of such a deal, reported the Wall Street Journal earlier this month. But that's not Trump's style... After bringing on former federal prosecutor Joe diGenova on Monday - a former Special Counsel himself who went after both the Teamsters and former NY Governor Elliot Spitzer, Trump is reportedly taking the gloves off according to Vanity Fair's Gabriel Sherman. Earlier this month, Mueller crossed one of Trump’s stated “red lines” when he subpoenaed Trump Organization business records. According to four Republicans in regular contact with the White House, the move spurred Trump to lose patience with his team of feuding lawyers. “Trump hit the roof,” one source said. Today, Trump’s personal lawyer John Dowd resigned under pressure from Trump. 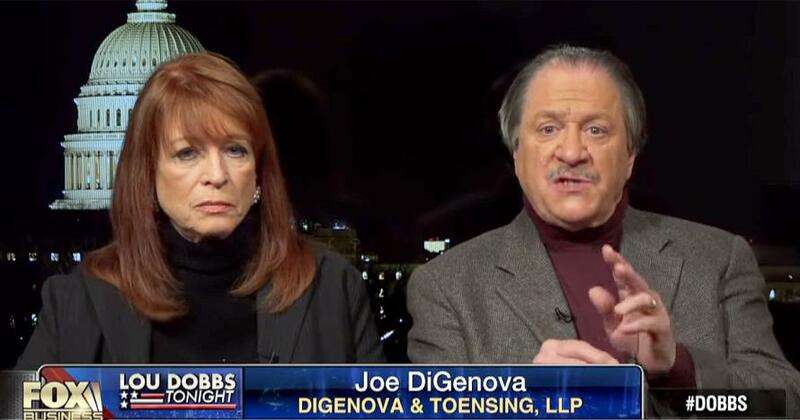 diGenova - who said in January that the Obama administration engaged in a "brazen plot to exonerate Hillary Clinton" and "frame an incoming president with a false Russian conspiracy," is married to Victoria Toensing - who, as we've mentioned, is a former Reagan Justice Department official and former chief counsel of the Senate Intelligence Committee. “She’s a killer,” one Republican who knows the couple told Sherman. Toensing also happens to represent FBI whistleblower William D. Campbell - who claims to have gathered evidence of a Russian "uranium dominance strategy" which included millions of dollars routed to a Clinton charity. Campbell testified before three Congressional committees in February. The Campbell connection makes it all the more interesting since Trump is reportedly considering adding Toensing to his legal team. In other words, Trump would be teaming up with two veteran bulldog D.C. attorneys - one of whom ostensibly has evidence in the Uranium One scandal. As Sherman points out in Vanity Fair, "The hiring of Toensing would be a sign that Trump wants to flip the script and investigate his investigators. Appearing on Fox News, Toensing has called for a second special prosecutor to investigate Mueller, the logic being that he was F.B.I. director at the time that the Uranium One acquisition was approved." Following Mueller's subpoena of the Trump organization, Trump has been fuming. Last weekend, Trump encouraged John Dowd to call for an end to the Russia probe, according to Sherman. "On Sunday, Trump blasted Mueller as partisan, tweeting: “Why does the Mueller team have 13 hardened Democrats, some big Crooked Hillary supporters, and Zero Republicans?”"
diGenova was reportedly recommended to Trump by Dave Bossie and Jeanine Piro - both of whom are outside advisors to Trump. That said, Fox News Senior Judicial Analyst Judge Napolitano thinks Dowd's resignation and the decision to put Trump in front of Mueller's team would be a "disaster" for the President. "It's very, very easy to trip somebody up when you have all the documents, you have all the testimony, you have all the prior witnesses and you're asking somebody questions that you know the answers to and that they don't," Napolitano said on "America's Newsroom" in late February. Sherman also reports that Trump is considering bringing back controversial attorney Marc Kasowitz onto his defense team. Kasowitz had reportedly told Trump that Jared Kushner needed to leave the White House. With the departure of John Dowd and the addition of diGenova and Toensing - combined with Trump's desire to testify in the Mueller probe, this could go either really well for President Trump - or it could be his downfall. Either way, it promises to entertain.